"Greasy kitchens may be a thing of the past - thanks to super little grease eaters." Almost every food or drink production process involves the use of sugar or starch. Bakeries, restaurants, breweries, and soft drink manufacturers send excess sugar and starch down their drains and into their drainage systems. Once there, these wastes settle in the bottom of drain lines, accumulating until they completely block the pipes, often causing backups. The video entitled "How SES Works" on this page shows how sugar build-up from soft drink syrup can rapidly clog a drain line. This pipe is 70 per cent blocked after just four months. Additionally, sugar and starch build-up contributes to high BOD (Biological Oxygen Demand) and TSS (Total Suspended Solids) levels, which can add up to expensive plumbing bills and large fines (surcharges). 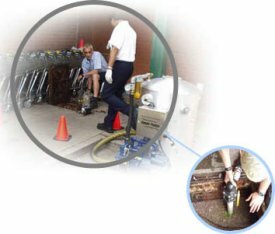 Desperate facility managers often turn to harsh chemicals and solvents or mechanical routing to clear the drain line blockages formed by waste sugar and starch. However, these methods offer a quick fix and risk damaging the pipes further, ultimately resulting in costly repairs and lost revenue from production "downtime". Worst of all, the problem inevitably reappears a few months later. Environmental Biotech's Sugar Eradication System (SES®) provides a permanent solution to sugar and starch build-up. The Sugar Eradication System (SES®) harnesses the power of live, vegetative, non-toxic bacteria in a process called bioremediation. When pumped into drainage systems, these bacteria actually eat the blockages, converting them into harmless by-products mainly water. So the bacteria not only save you time and money in costly repairs, they help the environment as well.